We have revamped the Editorial Team from this month to take this ezine to next level. Details are given in this edition. 1. Editorial : Susan Koshy (Editor in Chief) writes on Leadership traits in every day life. 2. Cover Story : Recently, Nilavembu Kashayam, a Siddha medicine helped in the prevention and treatment of the Dengue Fever, thus saving thousands of lives in Tamil Nadu. This has brought the Siddha system of medicine to the centre stage. 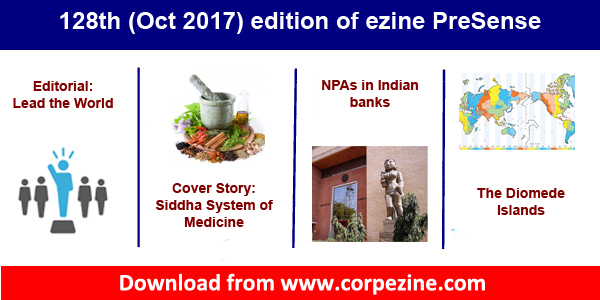 K. Srinivasan (Managing Editor) and Dr Jagannathan (Editorial Advisor) write about the strength of the Siddha system of Medicine and the challenges faced by it. 3. Nation: V Rajendran (Editor) writes on the Non Performing Assets (NPA) in Indian banking system and the urgent need for fixing NPA norms in Indian perspective, instead of following Western style. 4. Special article : Sukruti Narayanan writes on the Diomede Islands, where two locations separated by 4 KMs have a time difference of 21 hours. 6. An exclusive interview recorded by us in October 2009 with Dr Abdul Kalam on "Three Dimensional approach to maintain good health". This ezine may also be downloaded from this link. We are confident that you will enjoy this edition too. Please share this edition with your contacts. Please send your feedback to us at editor@corpezine.com.